It goes without saying, but Georgetown really is beautiful. 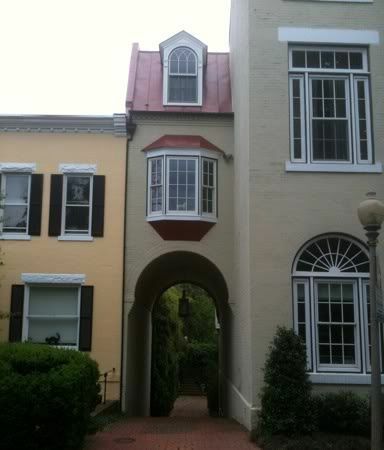 Look closely in the window there, above the arch. A pony statue, what a nice touch! Moments after I took this picture, I attempted to bike back home. I wrote about how I've been biking a lot, but I never said I was good at it. I'm not the best - I have a lot of trouble starting from a stop. In this particular instance, I was on the sidewalk trying to go up a hill, and I guess the gear was too high because I was so wobbly and close to falling over. Then I heard a voice from behind me say, "Need a push?" It was a friendly dog walker, and she pushed on my bike's rear rack until I could get going again. Much like you would do for a toddler on a Big Wheel. Posted in DC and tagged with Bike, Embarrassing Situations. May 24, 2010 by Adele Chapin.